Scientists from The Scripps Research Institute (TSRI) and the Janssen Pharmaceutical Companies of Johnson & Johnson (Janssen) have found a way to induce antibodies to fight a wide range of influenza subtypes—work that could one day eliminate the need for repeated seasonal flu shots. Seasonal flu typically causes more than 200,000 hospitalizations and 36,000 deaths every year in the United States, according to the U.S. Centers for Disease Control and Prevention. While a yearly flu shot provides some protection, subtypes not covered by the vaccine can emerge rapidly. This phenomenon was evident in the 2009 spread of the H1N1 (“swine flu”) subtype that killed an estimated 151,700 to 575,400 people worldwide. In the last decade, several studies from TSRI, Janssen and other institutions have shown that some people are capable of making powerful antibodies that can fight many subtypes of influenza at once by targeting a site on the influenza virus that does not mutate rapidly. Unfortunately, these “broadly neutralizing antibodies,” or bnAbs, are rare. Still, the tantalizing existence of broadly neutralizing antibodies led Janssen and TRSI to try creating an influenza vaccine specially designed to elicit them. Researchers zeroed in on a possible target: a protein on the surface of influenza, called hemagglutinin (HA). HA is present on all subtypes of influenza, providing the key viral “machinery” that enables the virus to enter cells. Most importantly, the long “stem” region of HA, which connects the virus to cells, plays such a crucial role that mutations at the site are unlikely to be passed on. “If the body can make an immune response against the HA stem, it’s difficult for the virus to escape,” Wilson explained. To create antibodies against the HA stem, the research team looked to influenza’s own structure, specifically the universal recognition site of the broadly protective antibody CR9114 in the HA stem (described by Dreyfus et al., Science 2012). This vaccine candidate was designed, produced and tested by a team of scientists led by Jaap Goudsmit, head of the Janssen Prevention Center, the paper’s first author Antonietta Impagliazzo (responsible for the design) and co-senior author Katarina Radoševi?. The effort represents the first time scientists have been able to cut off the variable head region of HA, designing features able to stabilize the conformation of the original protein, and at the same time faithfully mimicking the key broadly neutralizing site. 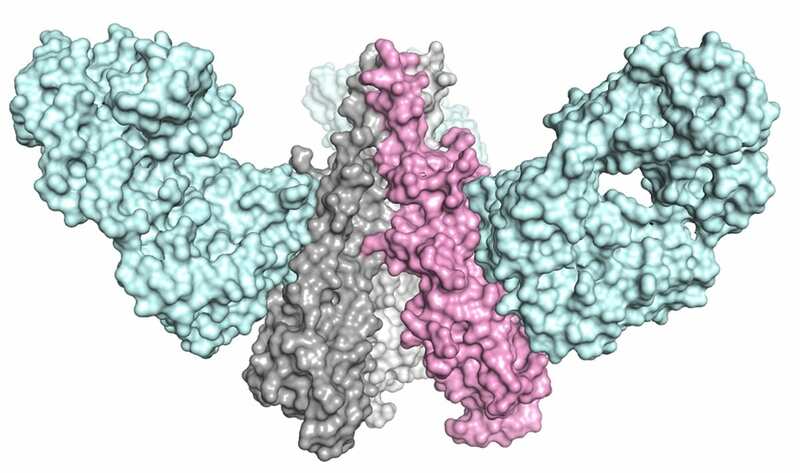 The ultimate goal was to use this synthetic version of the HA stem in a vaccine to teach the body to make powerful antibodies against influenza virus, priming it to fight off a variety of flu strains. The scientists then studied the response of rodent and nonhuman primate models given one of several candidate immunogens. They found that animals given one especially stable immunogen produced antibodies that could bind with HAs in many influenza subtypes, even neutralizing H5N1 viruses (“avian” or “bird” flu). Scientists at TSRI studied the structure of the immunogen at every point in the process. Using the imaging techniques of electron microscopy (led by TSRI Associate Professor Andrew Ward and postdoctoral fellow Ryan Hoffman) and x-ray crystallography (led by Wilson and TSRI Staff Scientist Xueyong Zhu), the team showed that the most promising candidate immunogen mimicked the HA stem and that antibodies could bind with the immunogen just as they would with a real virus. With proof that an immunogen can elicit antibodies against the stem region, Wilson said the next step in this research is to see if the immunogen can do the same in humans.